The guide offers three methods to disable sponsored offers during the installation or upgrade of Java on machines running the Windows operating system. Sun Oracle's Java is widely used both on the Internet and also locally on computer systems. While it is still being used on the Internet, modern browsers such as Chrome or Firefox will or already have removed plugin support for Java preventing users of the browser to access content on the Internet that requires the plugin. Applications may require Java to run, and while some may ship with the Java installer included to make things easier for the user in regards to adding Java to the system, others require that Java is already installed on the system to run. This installer may include third-party offers (adware) that is not required to run Java. As is the case with most of these offers, it is selected to be installed by default and if you don't pay attention to the installation dialog, will be installed on the computer system automatically during the process. Computer users have three options to avoid Java offers, with one of them being limited. Note: Sponsored offers are included in Java for the Windows platform and Mac OS X. 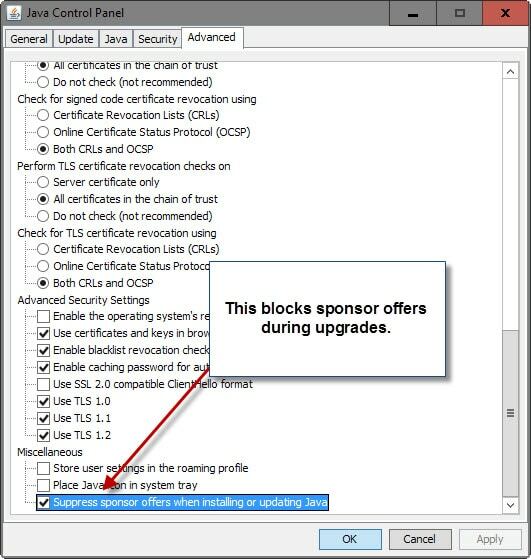 This is the easier, and recommended method according to Oracle, to block sponsored offers during installation or upgrade of Java on a computer running Windows. Use Windows-Pause to open the System Control Panel applet. Click on "Control Panel Home" in the upper left corner of the window opening up. Click on the Java applet. Switch to the advanced tab in the Java Control Panel window. Scroll all the way down to "miscellaneous" and check "Suppress sponsor offers when installing or updating Java. Click on the Apple icon. Click on the Java icon to access the Java Control Panel. Follow the last entry of the Windows instruction. The method won't work, obviously, if Java is not installed on the system. That's when the command line parameter SPONSORS=0 comes in handy. Basically, what you need to do is run the Java installer from the command line with the parameter to block sponsor offers during installation. 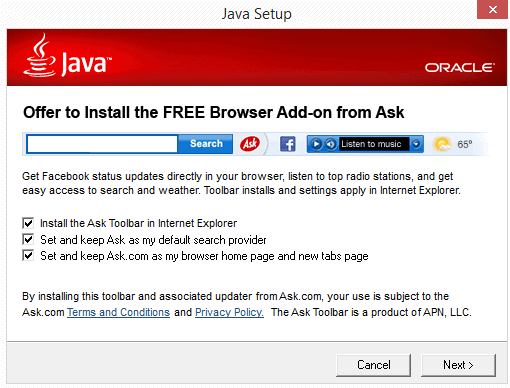 Java is offered as a stub installer and full installer. By default, the stub installer is provided which requires a working Internet connection during installation to download installation files (and the sponsored offer). The full installer for Java on the other hand ships without sponsored offers. This makes it an ideal candidate for first-time installations of Java on computer systems. In addition, you may upgrade Java by downloading the latest version of the full installer instead of using Java's automatic update feature. Use the manual download page on the Java website to grab the offline installer for your operating system. I still recommend that you make sure that there are no sponsored offers included during installation. If you don't need Java to access online content, you may want to make sure that it is disabled in the web browser of choice. If you do need it, you may want to limit the exposure of Java. In Firefox you could set it to click to play for instance so that it is not executed automatically on sites you visit. Find out how to block third-party sponsor deals when installing Java on a machine running Windows or Mac OS X. Thanks, Martin, I didn’t realize that setting was there. I only install it when I absolutely MUST and even then I only install to use it, and uninstall it directly after. If they would actually be nice with it, and actually SECURE it, and not wait for 3 months or just ignore it with updating, Java would have been a better success. I completely uninstalled Java from this PC nearly a year ago, just to see how much I might miss it. I have not missed it at all. Apart from one or two web sites (e.g. those that use Java apps to measure your internet connection speed) that I don’t rely upon, I’ve not been hindered in any way. I am a little surprised but very pleased with this finding. It’s good not to have to worry about this software’s security flaws all the time.